It's a menu plan, yes, but not for this week necessarily. Because of people traveling and other people having evening activities, supper as a family is going to be a little hit and miss in the next couple of weeks. So instead of pretending, I decided to just put it out there. Into the universe. Do with it what you will. This free-form menu plan feels appropriate for what I consider to be our last few weeks of summer (defining summer as it's hot and the kids are not in school for an extended period of time). We actually have about 3 1/2 weeks before the kiddos head back to school... So I guess we just have to repeat once? Or eat a lot of leftovers? The crazy short summer continues, y'all, and one month from today, the kiddos will be heading back to school. I'm just not sure what to say about that. This week, the two oldest boys who live here begin bike practice two days a week, which means I'm back to planning two meals a week that can be eaten in shifts. The slow cooker is great for this--it'll cook the food, and it'll be ready when shift one wants to eat, and then keep it warm for subsequent shifts. Unfortunately, our family doesn't really care too much for slow cooked food. Maybe I need to try some of these recipes? I also purchased another Wildtree workshop, this time a slow cooker one, so maybe we'll like some of those recipes as well. This week, our eaten-in-shifts meals are spaghetti and BLTs. I know. Spaghetti isn't too shifty. But it kinda is when the two younger boys who live here don't eat sauce. What are your favorite on the go or able to be eaten in shifts meals? 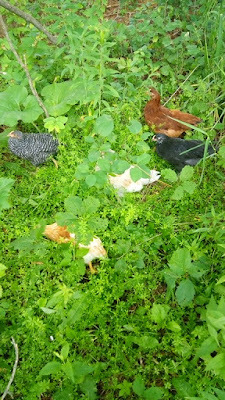 The chicks have been with us for eight weeks now. 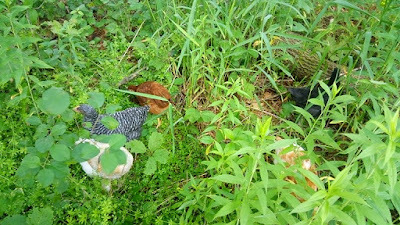 Seems like forever, and then sometimes it still seems a little surreal that we actually have chickens. 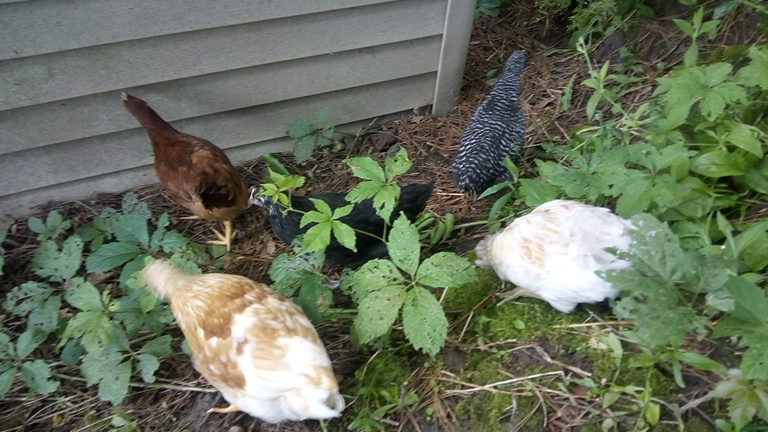 They've been out in their coop for two weeks now, and have completely defoliated the run. That didn't take long. 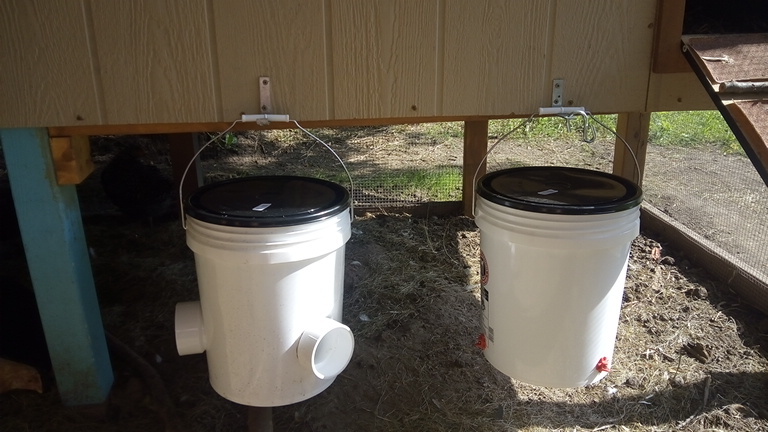 Just in case you're wondering, the hen house is the building where the girls sleep. The run is the enclosed "predator proof" (hopefully) outdoor area. 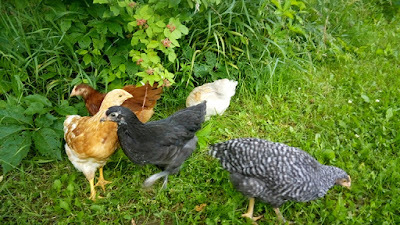 The coop is the hen house + the run. Bubby continues to pick up chicks every chance he gets. 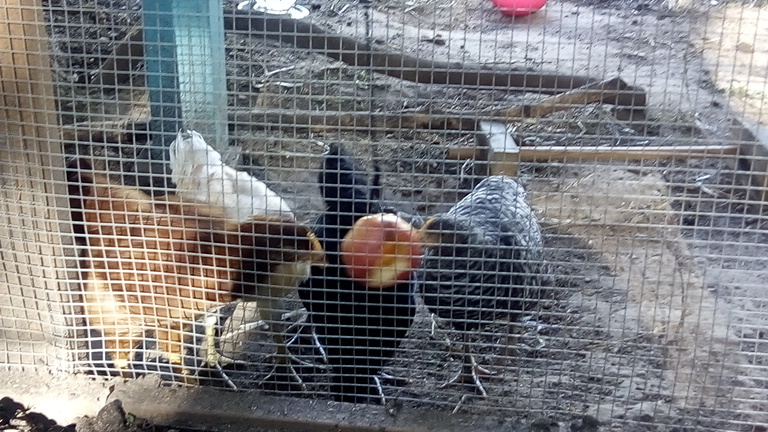 It gets a little tedious in the coop, since all the green stuff is gone, and probably most of the bugs have been eaten, too, so every now and then I'll bring the girls a treat--here they are playing tetherball with an apple. 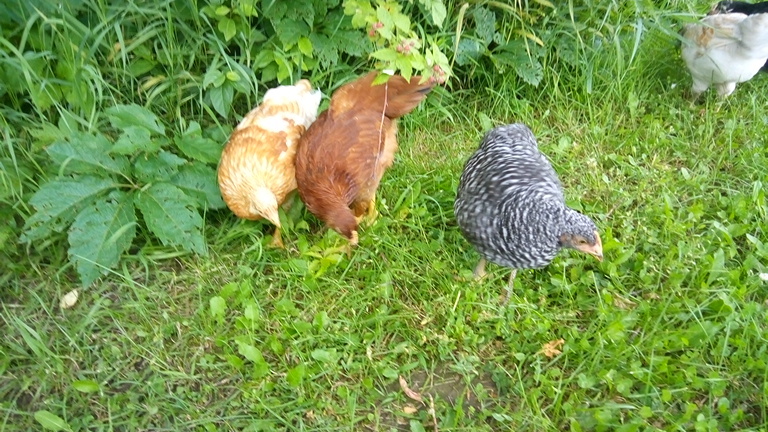 I've been letting the girls out of the coop for an hour or so every now and then. Now whenever I show up, they gather by the door, hoping for a chance at some fresh pastures. 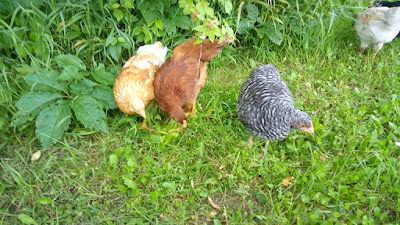 I still don't let the girls out by themselves because they're so small, so I let them out close to sun down. 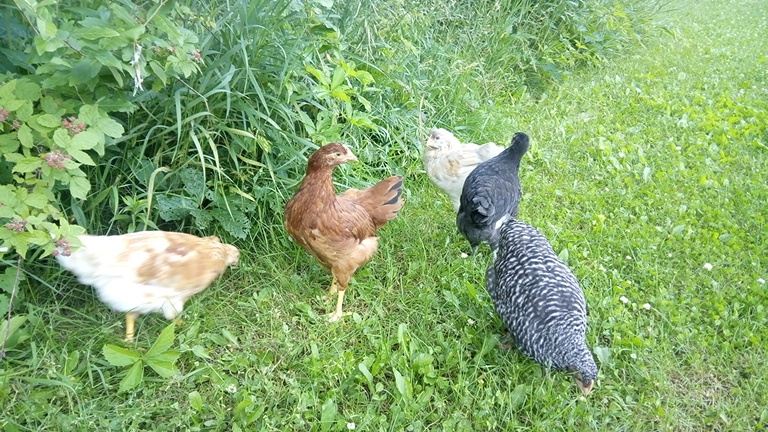 They go back into the coop on their own as it gets darker. 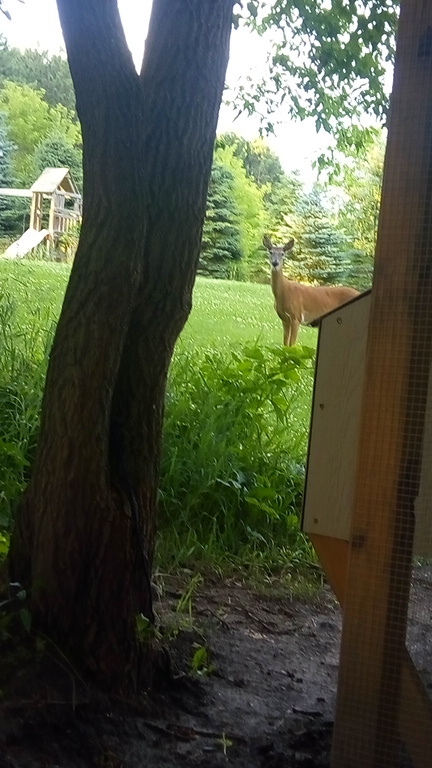 The other night, this deer wandered into the yard while I was supervising the girls, and watched me watching the chickens. Then she snuck up on me. 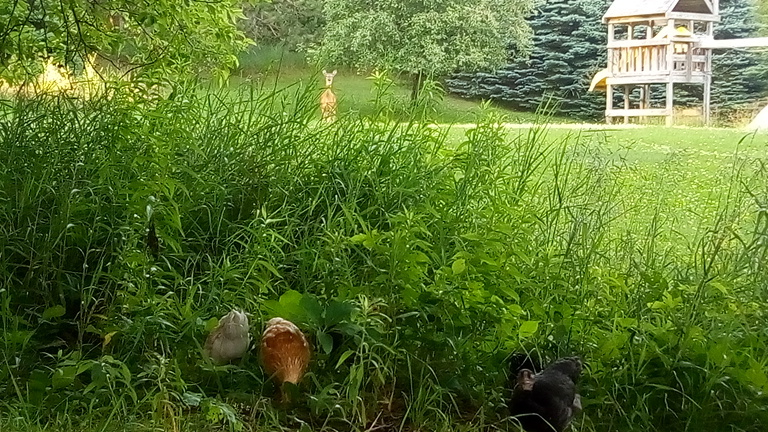 Had to get a closer look at the crazy chicken lady, I suppose. I think I told y'all in a previous update that I was obsessing over Esther's gender. 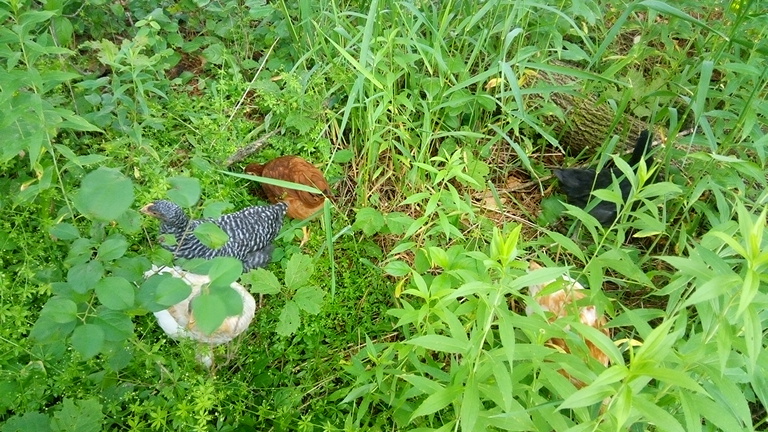 I finally figured out what all those chicken people were talking about when they said single or triple comb, and at this point, I'm pretty sure all the girls are, indeed, girls. Rounded instead of pointed feathers, combs still yellow or light pink, no spurs, no wattle development, and in Esther's case, a single pea comb and even coloration. 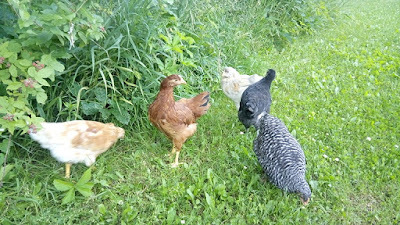 Won't know for sure for sure until they start laying eggs, of course, and I found out that chickens can change gender. What?! Yeah, you heard me. The girls will be excited when these wild raspberries ripen. The girls have dug a hole in the run for their dust bath. They put it where I was planning on putting it, when I get around to making a dust bath. 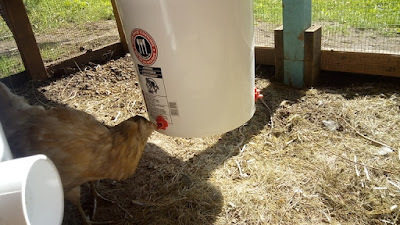 I'm not sure what that means when owners start thinking like their chickens. I had heard that dust bathing is a social activity for chickens, and it is. For some reason they need to be right next to each other. Much squawking ensues. Speaking of right next to each other, Esther continues to like to snuggle with her sisters. She'll walk up and plop herself down, sometimes right on top of somebody else. Much squawking ensues again. 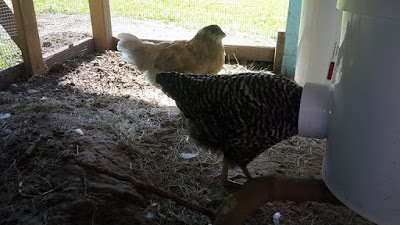 The girls have been doing a bit of what I would call posturing--makes me wonder if they're figuring out their pecking order. Two of them will get right up in each other's faces, stretch up their heads so they're as tall as possible, and flap wings at each other. Sometimes one will peck at the other's beak. 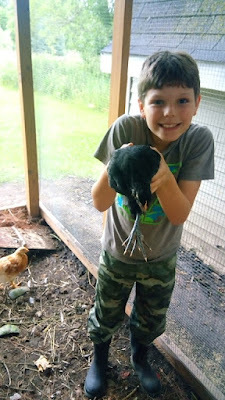 I'm realizing why people who are afraid are called chickens. Chickens are so cautious and suspicious of every new thing. And when one gets spooked, the others all get spooked. It's funny to watch them all run around in response to one getting all worked up. I try to reassure them, but they don't listen. Every week, I keep thinking this is going to be the last menu plan for a while (at least the last posted menu plan for a while), and every week, I'm wrong. Maybe this week?